The Canadian Opera Company launches their 2011/2012 season with a visually arresting and chillingly atmospheric production of Gluck’s bright and hauntingly beautiful Iphigenia in Tauris. Under the directorship of Robert Carsen and the baton of Pablo Heras-Casado, this Greek myth turned opera mesmerizes without relent. The plot of Iphigenia in Tauris is not a simple one, and is further complicated by the fact that the events of Tauris are preceded and put into context by an entirely separate and equally grandiose tale, Iphigenia at Aulis (itself a sort of prequel to the story of the Trojan war). Needless to say, Tauris is the type of opera that necessitates a glance over the program notes before the house lights dim. The core of the narrative is this: Iphigenia (Susan Graham), the daughter of a famed Greek general, is clutched from the hands of death by the Goddess Diana, who transports Iphigenia to the isolated kingdom of Tauris. Indebted to Diana, Iphigenia lives as a priestess obliged to (as prescribed by the Gods) do the bidding of Thoas, Tauris’ king (Mark Doss). Thoas, terrified by an oracle’s prediction of his death at the hands of a stranger, orders Iphigenia to sacrifice any newcomers who enter Tauris. Tragedy strikes when Orestes (Russell Braun), Iphigenia’s beloved brother, and his dear friend Pylades (Joseph Kaiser), are shipwrecked on the shores on Tauris, placing Iphigenia in the heart wrenching position of having to either kill her sibling or defy the deities and suffer the consequences. It’s the type of nightmarishly fatalistic drama that perfectly complements the operatic medium. The entire creative team embrace this over-the-top quality and deliver a highly stylized performance that works hand in hand with the source material. Director Robert Carsen and his associates present the audience with a sparse production design; the set - essentially a large carbon coloured box with a grid like texture - acts as a canvas for chalk, ink black water, and vivid shadow play, all of which are used to great effect. The lighting, designed by Carsen and Peter Van Praet, is equally evocative, emanating from the performers’ feet like the glow of Hades and casting the characters’ silhouettes thirty feet tall. Another wonderful choice is the substitution of an on-stage chorus for a dance ensemble that brings an entirely different form of performance into the already impressive mix. 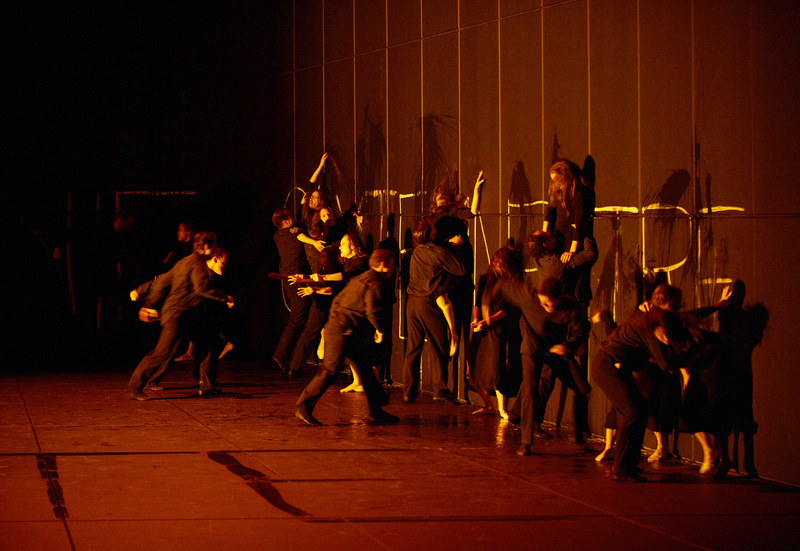 Philippe Giraudeau’s choreography is well synched with the rest of the piece, his dancers often moving through the space in organic unison like a flock of birds, or writhing in agony in tandem with the protagonists’ torments. Gluck’s score is something of a counterpoint to the aesthetics; written in 1789, it possesses the calculated grace characteristic of his contemporaries, such as Hayden or Mozart, but also an exuberance and energy more commonly associated with later romantic composers. It is this contrast that makes Iphigenia at Tauris such a rich and enjoyable musical experience. Conductor Pablo Heras-Casado relishes Gluck’s lively indulgences, making the work’s fleeting moments of joy stand out both musically and narratively. Veteran mezzo-soprano Susan Graham shines in the titular role, her emotive voice capturing both the detached otherworldliness of Iphigenia’s existence and her more personal emotional turmoil. Russell Braun was absent due to a cold on the night this reviewer attended, but word on the street is that Canada’s own baritone star is feeling better and in fine form. His understudy, Adrian Kramer, stepped in to play Orestes and did not disappoint, giving a convincing and heart-felt performance - especially when across from Joseph Kaiser as Pylades, Orestes’ bosom buddy. Combining age-old works with contemporary stagecraft is one of the common challenges of modern opera, but Iphigenia at Tauris pulls it off perfectly. It’s a powerful and visionary production that ought not to be missed.